Unloading Time: Ten (10) minutes per cubic. yard., thereafter standby at $105.00 per hr. 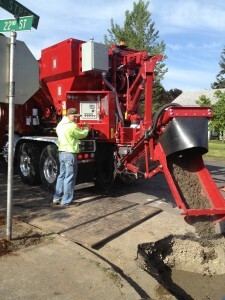 All our concrete mixes are metered off the truck rounded up to the nearest 1/4 yard. We can deliver as little as a few bucketfuls or as much as you need. You pay only for what you use (1/2 yard min. in town, 1 yard min. out of town.) There is never any “leftover” concrete dumped at your job site. Maximum delivery is 8 cubic yards per trip. I don’t know if you hear it often enough, but you should: I just called to let you know I think you’re great!